After a year that saw multiple macOS security issues, WWDC has finally arrived, and with it, Apple has a chance to address these concerns while also adding some helpful new features to the next version of its desktop operating system. So here’s everything coming in the next version of macOS version 10.14 Mojave. MacOS 10.14 is available today as a developer preview (download here), ahead of a public beta sometime in late June and an official release later this fall. In macOS 10.13, users had the option of turning the dock and top menu bars dark. But in version 10.14, Apple is going all out with a top to bottom dark mode in macOS Mojave. Apple says dark mode should help make photos pop a little more, put less strain on your eyes, and even make it easier to code since it includes a new skin for XCode. Everybody has encountered that person whose desktop is so littered with files and photos that simply looking at their screen gives you a headache. So to help those users out, Apple created Dynamic Stacks, which automatically sorts similar files together into groups that can be arranged by type, creation date, tags, and more. When you want to dive into a particular stack, all you need to do is click to expand, and then double-click to open. And unlike standard folders, if you drop a new file onto the desktop, Dynamic Stacks will automatically grab it up and put it in the correct spot. To help make viewing photos, videos, and presentations a little easier, Apple is adding a new gallery view to the macOS Finder. The main difference between gallery view and other viewing modes is that there’s a big preview section in the middle along with a row of thumbnails across the bottom, which should make it easy to quickly scroll through an album of shots. Photographers will especially love the new feature because in gallery mode, there’s also a new sidebar that shows full meta data for a particular image or video, including things like shutter speed, aperture, ISO, and more. In the finder, there are also new contextual quick action buttons that change (or customized) depending on the kind of files you are looking at, so you can do things like add a watermark or create a PDF out of a batch of photos all without touch an editing app. Everyone has run into a situation where you need to sign an electronic file. It’s annoying, it’s tedious, and often forces people to look for a third-party solutions to finish the job. But thanks to the new Markup tool in Mojave’s Quick Look, you can easily add signatures to documents, or do simple edits to photos and videos like cropping, rotating and trimming. While taking screenshots isn’t any different in Mojave, what you can do after you’ve snapped one has gotten an upgrade. Now, after capturing an image, you’ll immediately see a thumbnail in the bottom right corner. From there you can expand the preview by double-clicking on the thumbnail, which will open the screenshot in Markup so you can make quick edits. The screenshots tool also features an expanded menu, with new options so you can record video (both full-screen and selected areas) directly. Continuity in macOS is all about bridging the gap between your phone and you computer. So in addition to macOS’ existing ability to seamlessly sync messages and files, Continuity is getting a new camera feature that lets you turn on and snap a picture on your iPhone from your computer, and then import that image directly into a piece of content on your laptop. And if you want, you can even use Continuity Camera as a scanner of sorts by using your phone to take a picture of a document, and letting macOS Mojave automatically square up the sides and turn it into a more usable file. 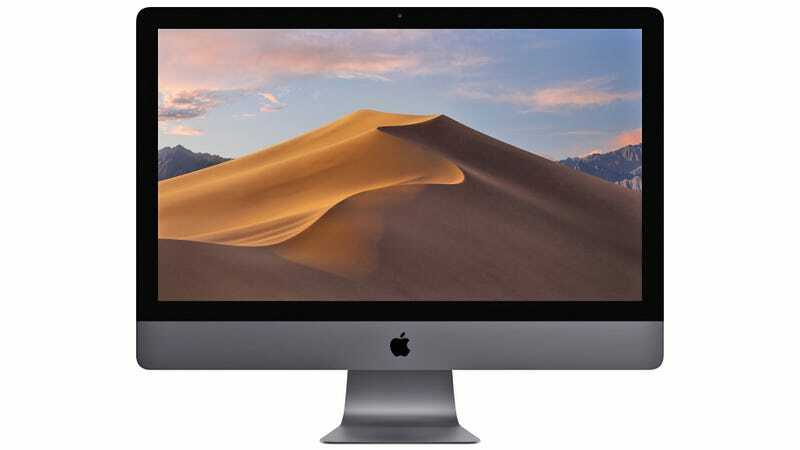 In addition to all the new features and tools, Apple is beefing up Mojave with a new range of default apps including Apple News, Stock, Voice Memos, and Home, which are all available on Apple’s desktop OS for the first time. On top of that, Apple has done a complete overhaul to the macOS App Store by adding a new UI, better curation via the Discover tab and improved app suggestions. Last but not least is FaceTime, which is getting an upgrade across all of Apple’s major platforms to support group calls with multiple people at the same time. Users will be able to drop in and out of videos call whenever they want, and conversations can be held on iPhones, iPads, and Macs, or even an Apple Watch if you don’t mind doing it strictly through audio.